Ross Fitness was Founded with Kyle Ross’ Lifelong Passion for Health, Fitness, and Sports. I have been in the fitness industry since 2004 and honestly can’t imagine doing anything else. I started working out regularly in college because I had a very bad confidence problem and something about building muscle and being stronger really spoke to me. I eventually became addicted devoting my time to researching and training. The result was I completely changed my body and my life. I knew I had to share this feeling with as many people as possible because making real changes in your life is not always easy, but it can be very simple, if you know what the steps are and you can learn from someone who has done it. In 2004 I then became certified as a Personal Trainer through the International Fitness Professionals Association. Then in 2007 I got certified as a Post-Rehabilitation Specialist to work with my clients on preventing injury and specializing in nerve and back pain. I also had the opportunity to work with the US Army and was awarded as an “Honorary Fitness Interrogator” for my support of Fort Devens Tass Training Center Soldiers in regards to physical fitness, and overall health. My 12 Week body transformation system has helped over 253 Nashoba Valley Residents drastically and permanently change their lives. We do this by a comprehensive program that focuses on movement first and then strength using the whole body to work as a whole. When you’re ready, I am here to help. I am incredibly passionate about my program and the power it has to transform lives. 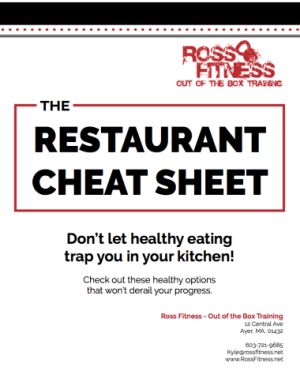 To find out more about everything I offer, feel free to call me directly at (978) 772-7677 or via email at Kyle@rossfitness.net.